Jacek Klimkiewicz was born in Warsaw, where he studied with Irena Dubiska, a pupil of Bronislav Huberman and Carl Flesch. He soon won the first prize at a competition in Lodz and became leader and solo violinist with the Polish Chamber Orchestra. He made his orchestral debut at the age of 18, performing Paganini's First Violin Concerto in the National Philharmonic Hall in Warsaw. He completed his studies by attending the master classes of Ilona Feher (Rubin Academy of Music in Tel Aviv) and Henryk Szeryng and taking his concert examination with Wolfgang Marschner in Freiburg. 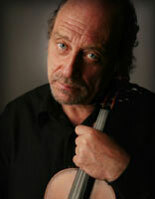 Jacek Klimkiewicz has been professor of violin at the Folkwang Hochschule in Essen since 1992, serving as dean from 1998 to 2000. He played first violin with the Sonare Quartet. In addition to making radio and commercial recordings (German Record Critics' Prize, Prix Répertoire Paris and the "Favorites of 1989" record of the year in Miami), he has undertaken several extensive concert tours of most European countries, Japan and South America, and has taken part in interesting music festivals, such as Holland Festival and the Akiyoshidai Music Festival in Yamaguchi (Japan). Jacek Klimkiewicz plays a violin by Januarius Gagliano, Naples 1770. Belgian violinist Henry Raudales was born in Guatemala. His father Enrique Raudales started Henry on the violin at the age of four and he played his first concert at the age of seven with the North Carolina Symphony Orchestra. A few years later, he received lessons from Erick Friedman. In that same period, Yehudi Menuhin invited him to study in London. When Henry was 14 he played for the panamerican union receiving an award for the best young violinist of the year. Henry also studied conducting with his father, and finished his studies at the Conservatory of Guatemala. When Henry was 16, he became a member of the Royal Flemish Opera of Antwerp and studied at the Royal Conservatory of Antwerp, obtaining first prize and higher diplomas with the highest distinction. That same year he studied with Henryk Szeryng and Mrs Kogan. Some years later he studied conducting and general musicianship at the Guildhal School of Music and Drama. In 1984 Henry was a member of the Brussels Radio Orchestra. One year later he won the radio competition in Brussels, the concertmaster position at the Royal Flemish Opera and the 2nd prize ex aequo at the Queen Elisabeth Competition in Brussels. Since then, he has been playing innumerable concerts and recitals throughout the world. Henry Raudales was concertmaster of the chamber orchestra I Fiamminghi which he conducted on many occasions. He was the founder and conductor of the chamber orchestra Celestial Consort (1995-1999). In 1993 he obtained the position of concertmaster of the Essener Philharmoniker, and in 2001 at the Munich Radio Orchestra, where he gets to conduct 2 productions a year. Henry has conducted and played with orchestras at festivals around the world and has made recordings as a conductor, a chamber music player and a soloist. 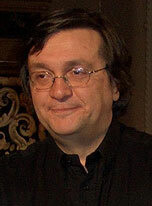 In 2006 he founded the chamber orchestra Camerata Enkabara. Since 2007 he is professor at the Royal Conservatory of Antwerp. 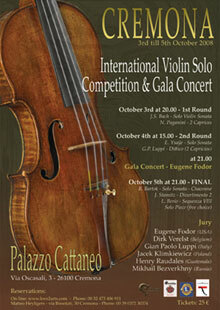 Gala Concert at the Palazzo Cattaneo in Cremona with Eugene Fodor on October 4, 2008 at 9pm. Program: J.S. Bach, E. Ysaÿe and N. Pagganini.